Don't judge me according to the way I live because I'm the one who can change it from. Negative to positive. Positive minds produce positive lives. 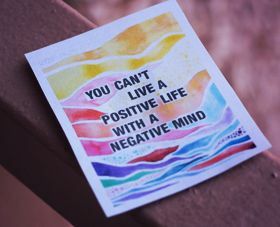 Negative minds produce negative lives. I hate being in the mood where I'm not happy with how my life is, but I have no idea how to change it. You can't live your life waiting for the bad things to happen. Live for the best and deal with the worst. If you live looking back at all the regrets, you'll never live according to your fated lifespan. So often times it happens that we live our lives in chains, and we never even know we have the key. A person with a negative or a pessimistic attitude leads a negative life. A negative person can never find his way out of a conundrum and generally gives in, when faced with difficult circumstances. A negative person can't steer his way through challenges and adversities and gets bogged down by them easily. Everything seems yellow to the jaundiced eye and everything seems negative, irritating and out of reach for a negative person. A negative person leads a negative life. Nothing can ever function smoothly in the life of a person who has a pessimistic approach. A negative life can be converted into a positive one by changing one's attitude and approach towards life. Adopting a positive attitude and having a never-say-die spirit is a must. Winners never quit and quitters never win. One must develop an optimistic attitude and learn to go with the flow and live in the moment. Learn to let go of things which are no more in your control and take charge of things that you can still change and improvise upon. As long as you are alive, you will always have options to evolve into a better person.